In the summer I would never even see this bench behind a hedge that today was completely visible because there were no leaves. Amazing the changes the seasons can bring, aren't they! Hope you're enjoying your weekend, Mary!! I love how the bareness of winter shows the hardscape made angular by lack of foliage. Good shot here! We now would like to see the leaves - visual proof of Spring. Someday...The sun though is strong now, so that we wait for the seasonal change with the hope of warmer days! It is a cute shot for SSS! A world without snow. Wow. I love it. Gorgeous shadows! Can't wait for the summer to come. Wonderful shadows that wouldn't have been there if the bench itself had been shaded by all the leaves. The leaves in the summer make the bench a perfect place to sit in privacy! 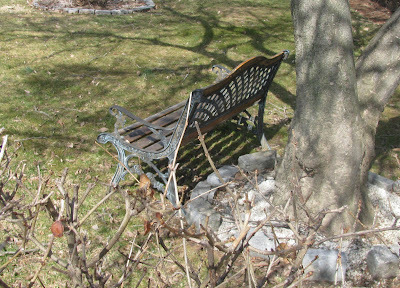 Now I see the photo of the bench! Cool shadow, Mary!